New research on an extinct weasel relative reveals what it might have eaten when it lived in North America and Asia about 20 million years ago. The oddly shaped skull of Leptarctus primus has long led to conflicting theories about its diet. But the new work, based on biomechanical modeling and published this week in the Journal of Vertebrate Paleontology, shows that Leptarctus was likely a carnivorous predator, with capability for omnivory and a broader diet when prey was scarce, and had a skull that functioned similarly to that of the living American badger. Leptarctus primus, which lived in the Miocene and was just a little larger than a housecat, has intrigued researchers because of its unusual and extremely robust skull. Strikingly, Leptarctus primus has two parallel ridges that line the top of the head (other carnivorans typically have a single central ridge or have smooth skulls). For many years, paleontologists have debated the ecological niche of Leptarctus based on conflicting interpretations of the strong parallel skull ridges, distinctive skull shape, and the shape of its teeth and chewing wear. Previous interpretations of their feeding lifestyle ranged widely, across virtually every type of known feeding behavior in carnivorans (dogs, cats, hyaenas, bears, seals, and weasels and their relatives), including herbivore, carnivore, insectivore, and omnivore. But because of the lack of quantitative research into how Leptarctus skulls functioned, the question of their diets remained unanswered. In this study, led by Alixandra Prybyla, who was a student in the Museum’s National Science Foundation Summer Research Experience for Undergraduates program while at Columbia University, the researchers took an engineering approach. The team compared an almost complete fossil skull of Leptarctus primus with 18 species of modern carnivorans with known diets as well as to other fossil species, using bite simulations based on CT scans of the skulls and virtual modeling of feeding mechanics. 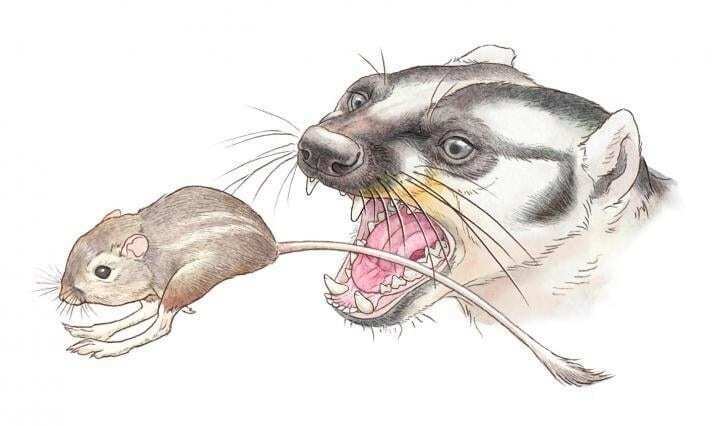 They found that among the other species analyzed, the skull of Leptarctus is mechanically most similar to the skull of the American badger. Despite some differences in their skull appearances, the computer simulations indicate that the badger is the best living biomechanical analog for understanding the dietary lifestyle of Leptarctus. Based upon those comparisons, the team determined that it was primarily a carnivore and an active predator, but that it could also have been an omnivore feeding on a wider range of plant and insect foods when necessary. “It was probably hunting down prey and taking in whatever it had access to most of the time,” Tseng said. The researchers will conduct future studies using similar engineering modeling tools to look at variations in skull feeding mechanics among other species in the leptarctine group, to determine how many different types of feeding adaptations may have existed among these unusual extinct predators.